Put August 6th on the calendar. We will be hosting a work day in the Nash Stream Forest, blazing and signing the Trio Trail — being built right this minute — from Percy Loop Camp on the north flank of North Percy Peak to the Trio Ponds Road and then down the Pond Brook Falls Trail and out to the Nash Stream Road. Volunteers will be blazing both north and south and putting up some signage along more than four miles of trail and repainting the lower half of the Percy Loop Trail in an orange color, because the Cohos Trail route will then be following the yellow blazes on the Trio Trail. Also, there will be some bridge and bog bridge projects underway on the upper length of the Pond Brook Falls Trail. Folks will begin assembling at the Pond Brook Falls parking pullout at Mile 5 on the Nash Stream Road in Stark township at 8 am in the morning. Sign-in will be at the pullout. A Cohos Trail Association volunteer will remain at the parking area for about 90 minutes to help with late arrivals. The work should continue until nearly 3 pm in the afternoon. Bring clothing that can get dirty and paint splattered. Bring a lunch and a snack, and plenty of fresh water. The Cohos Trail Association will provide tools, blazing materials, paint, and supplies for the bridge work. Some folks will be required to walk as many as five miles during this work day. Those who like a good woods walk should have a good time of it. You folks are rocking the mighty Cohos Trail. Lots of interest. Lots of sales of the new maps and databooks. More trekkers out on the trail than at any time in memory. Plenty of work has been done on the new Trio Trail from the Percy Loop Camp campsite on the north flank of North Percy Peaks all the way to the Trio Pond Road where the new Pond Brook Falls Trail meets that lane. The NorthWoods Stewardship Center crews are hammering out the big swing around Long Mountain as we speak and making substantial progress. Trail adopter Mary Sturtevant and Sam Farrington worked the Deadwater area recently, maintaining the long stretch in the backcountry of Clarksville township. They’ve made the route easier to follow out there. Pro photographers are showing up on the Cohos Trail more and more these days, looking for new terrain to train their lens on. On the website 52 With A View, the Percy Peaks have garnered quite a bit of attention of late. And why not. Great summits each. How to make more Cohos Trail? 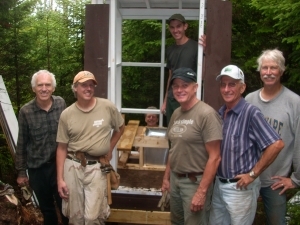 Copy the link below, share it, send it to Pluto and back, and help our little all-volunteer but mighty nonprofit trail building association raise $7,500 in the next three months so we can build more shelters, composting latrines, miles of new trail, bog bridges, and so much more. Donate to our Fundraiser Now Click Here! After four-and-a-half years serving as President of The Cohos Trail Association, Chad Pepau voluntarily resigned his position on the Board of Directors as an Officer on October 4, 2015 – following the 2015 Fall TCTA board meeting on October 3, 2015. In March 2011, Mr. Pepau took over the President’s position from former President, Peter Castine. At the time, Chad served as the organization’s Vice President. 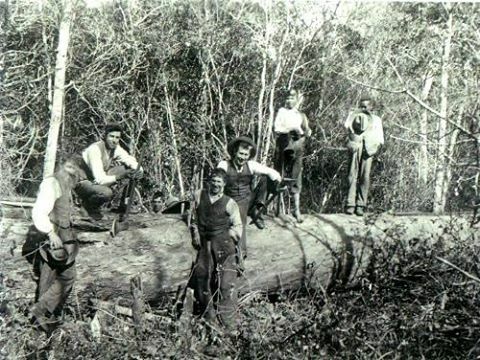 Primarily, there were two reasons which caused Chad to resign as President of The Cohos Trail Association. First, in September 2014, he relocated to the seacoast region of New Hampshire due to his employment with a construction firm which needed him for a job based in Dover, NH. In April 2015, he began employment with Pan Am Southern – a division of Pan Am Railways – based primarily out of the East Deerfield, Massachusetts rail yard as a freight conductor. This new career path forced Chad to move to Keene, NH to be closer to East Deerfield. Chad noted in his resignation letter to TCTA’s board of directors “Now that I am a railroader, I have accepted the fact that it isn’t just a job; however, it is more a lifestyle. My life will now primarily revolve around the railroad.” Chad will be on-call for the first two or three years as a conductor and then hopefully, he will have more time to give to the Cohos Trail. The second reason for his resignation is the fact that he is expecting his first child in January. Of course, having a little one will consume much of his off-time from the railroad. Chad asked TCTA’s Board of Directors if he could be seated as a Director on the Board. It was voted unanimously to allow him a seat on the Board and allow him to continue in this capacity to help guide the Cohos Trail into the future. TCTA’s Vice President Ken Vallery will now serve as the Interim President until this vacancy can be filled. Are you looking to have fun and perhaps get a little dirty on National Trails Day? Come join The Cohos Trail Association on this National Trails Day – Saturday, June 6, 2015 – in the largest township east of the Mississippi River… in Pittsburg, New Hampshire where we will build bog-bridge spans along the newly constructed Round Pond Brook Trail. If enough hands are available, we will also have time to do basic trail maintenance along the trail in this area. This would include brushing back the trail where needed, removing blow-downs, and touching up paint blazes as needed. 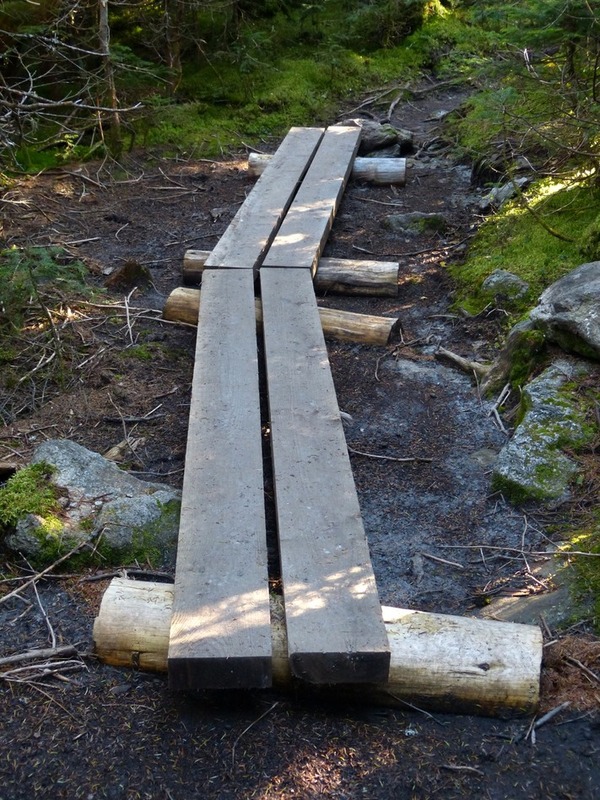 Bog-bridges are used to assist hikers traversing through wet areas of trail. Though they make getting through wet areas easier, their main purpose is to protect the underlying vegetation and minimize erosion. Where to meet: At the pull off along Route 3 in Pittsburg, NH. It is on the right side of Route 3 (headed north), approximately 4 miles beyond the road to Lake Francis State Park. This is the north start for the Round Pond Brook Trail and the south start to the 800′ Bog-Bridge Trail. 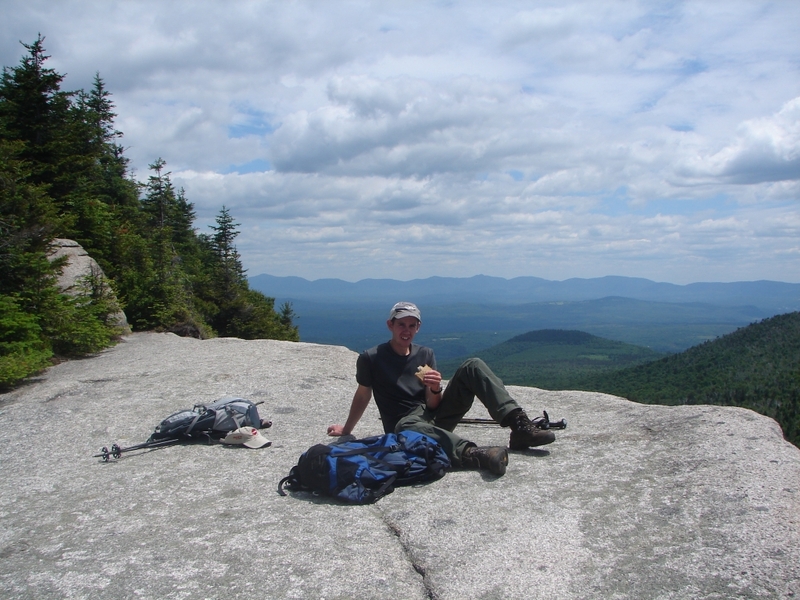 On Saturday May 9, 2015, The Cohos Trail Association’s Board of Directors will be gathering around a table in Colebrook, NH for its spring 2015 board meeting. During this meeting, TCTA will begin planning a wide array of different priorities that need to be accomplished this season. That being said, if you have been out on the mighty Cohos Trail recently, do you know of a particular area that could use some attention? Do you have a suggestion on how to improve the trail in a particular area? If you have answered “yes” to either of these questions, please feel free to share your ideas/concerns with The Cohos Trail Association. Using the eyes of the trail users such as yourself, we will better be able to improve the lengthy Cohos Trail. Your feedback is valuable to making the Cohos Trail even better in the future. Please e-mail Chad Pepau, TCTA’s President at [email protected] to share any and all of your ideas and concerns. Chad will be sure that your voice is heard at the upcoming meeting on May 9. In advance, thank you for taking the time to communicate with TCTA and helping to improve the experience one has along the Cohos Trail. It takes all of us to make things happen. In year 2000, we lost a soul on the Cohos Trail. One of the very first trekkers on the infant Cohos Trail followed a moose trail into the puckerbrush and was discovered a day later while wandering around in the backcountry of the Phillips Brook watershed, way off course. Now, since then, moose trails aren’t so readily confused for the treadway of the Cohos Trail. That’s because hundreds of people have volunteered to improve the trail over the last 14 years, and many have given what they can in hard-earned dollars to this all-volunteer association so we can do big things in the one-million-acre Great North Woods of New Hampshire. by gifting our little association with $5.00, $10, $25, $50, $100, $1,000, or a cool $1 million (we always throw that $1 million in there)? And if so, what would you receive in return for your generosity? 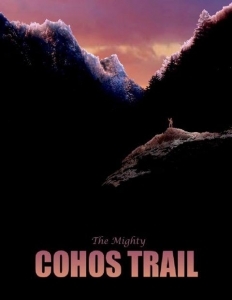 In 2015, we will undertake perhaps the most extensive effort on the Cohos Trail in its history. The work we will do, with your help, includes: 1. Relocating over five miles of trail; 2. Building five miles of all new trail; 3. 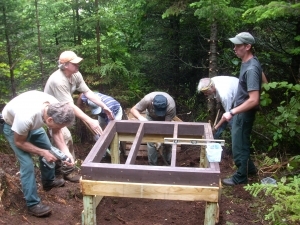 Constructing the new Devil’s Rest Shelter near Bald Mt. Notch; 4. Installing 400 feet of new bog bridging; 5. 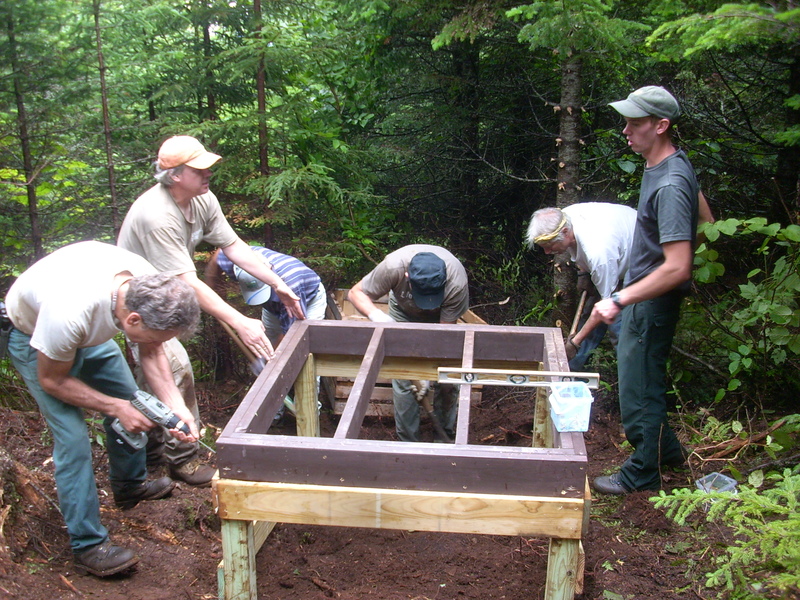 Helping erect a donated shelter at the Museum of the White Mountains (that we will move to a Cohos Trail site in 2016); 6. Putting up more kiosks with startling graphics on the trail; 7. Creating an all new map set and an all new Cohos Trail website. Go to www.cohostrail.org and donate securely through our PayPal link. 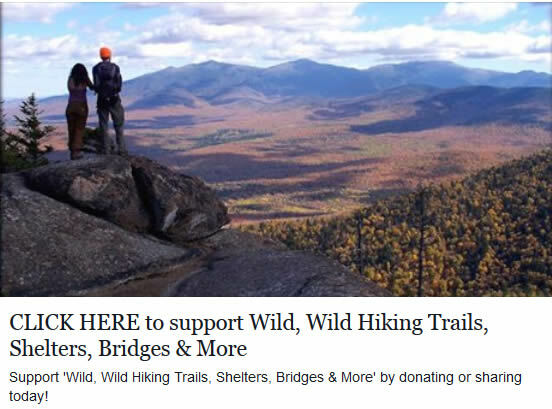 Or send a check or money order to: The Cohos Trail Association, PO Box 332, W. Stewartstown, NH 03597. You may also donate material. To do so, please call Chad Pepau at 603-331-5396 or Kim Nilsen at 603-363-8902 or Ken Vallery at 603-788-2720. And be sure to keep in touch with what is going on daily through our Friends Of The Cohos Trail page on Facebook. On Sunday March 29, 2015 beginning at 4:00 in the afternoon and lasting until 6:00 in the evening, at the Museum of the White Mountains in Plymouth, NH there was an exhibition preview to the new exhibit titled “Trail Clubs of the White Mountains.” Representing The Cohos Trail Association for this preview was TCTA’s President Chad Pepau, of Somersworth, NH. While the preview was by invitation only, this new exhibit officially opens to the public tomorrow, March 31 and will be on display through March 6, 2016. During the preview, invitees had a chance to meet and greet with members of the many trail clubs in the White Mountains including the Randolph Mountain Club, Appalachian Mountain Club, White Mountain National Forest personnel, Trailwrights, Squam Lakes Association, Shelburne Trails Club, Chocorua Mountain Club, among others. Also present were the lean-to builders, John and Caroline Nininger, owners of The Wooden House Company, Ltd. of Newbury, Vermont. Director of the Museum of the White Mountains, Catherine Amidon introduced the curators responsible for putting this exhibit together. They included Steve Smith, Mike Dickerman, and Ben Amsden. Mike spoke stating that it was fun for the team to dive into the history of the White Mountains, especially when it pertained to Trail Clubs, past and present. He also said that it took two years for all of this to come together. Steve Barba, former General Manager of the Balsams Resort in Dixville Notch and currently serving as Executive Director of University Relations at Plymouth State University, was also present and discussed a bit of history about the Balsams and the relationship that was built between the Tillotsons, the Balsams, himself, and The Cohos Trail Association. Steve stated that Mr. Neil Tillotson was quite pleased when the Cohos Trail’s founder, Kim R. Nilsen contacted him asking permission to place a new foot trail over Dixville Peak. The relationship Kim Nilsen created then continues to thrive today. The preview was well attended and everyone had a great time. 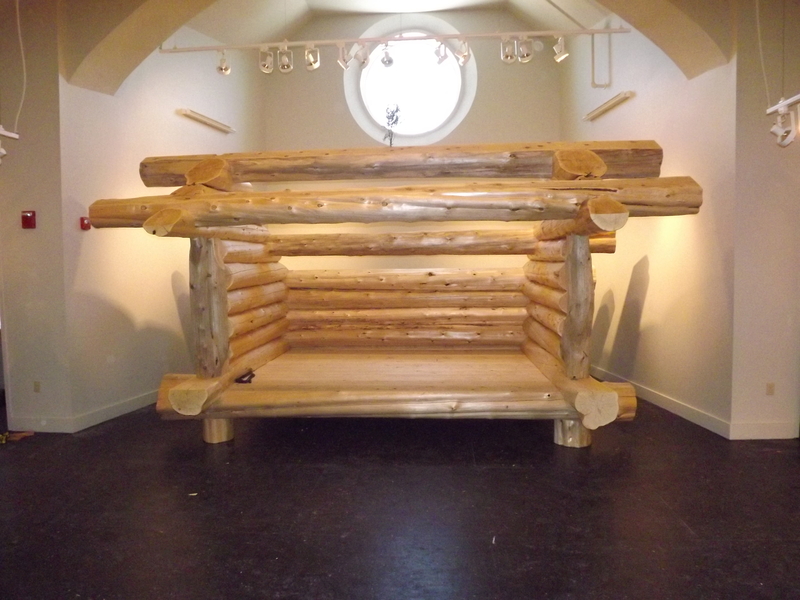 It brought great pleasure to Chad to be able to meet different folks and share many of the exciting things The Cohos Trail Association is currently involved with, along with plans for this summer, and of course, in 2016 when the log lean-to on display in this exhibit is actually moved north and placed along the mighty Cohos Trail in the Pittsburg region. 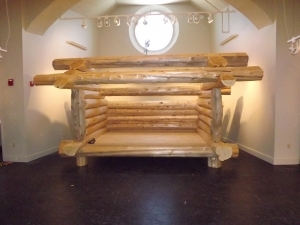 For your enjoyment, be sure to check out the video related to putting the lean-to together on March 12, inside the Museum of the White Mountains, as well as another video narrated by John Nininger, the builder of this magnificent lean-to. The handcrafted, log lean-to built by John and Caroline Nininger, owners of The Wooden House Company, Ltd.
LANCASTER – Officers of the all-volunteer nonprofit hiking trail organization known as the Cohos Trail Association (TCTA) learned this past week that two grants had been awarded to support increasing efforts to turn the 165-mile Cohos Trail from the White Mountains to the Canadian border into a major hiking destination in the Northeast. The New Hampshire Trails Bureau reported that TCTA had been awarded more than $27,555 in Recreational Trails Program funds to assist the group in building miles of new trails to help the association pull foot paths off roads to greatly improve the hiking experience, to help the group maintain some remote sections in Coos County, and improve aging hiking infrastructure, such as bog bridges. Within hours, the association officers learned that the group was also the recipient of $3,280 from the Neil and Louise Tillotson Fund, administered by the New Hampshire Charitable Foundation, to build and erect sign kiosks in many locations and outfit those kiosks with professional and highly visible graphics that would promote the trail and New Hampshire’s Great North Woods. 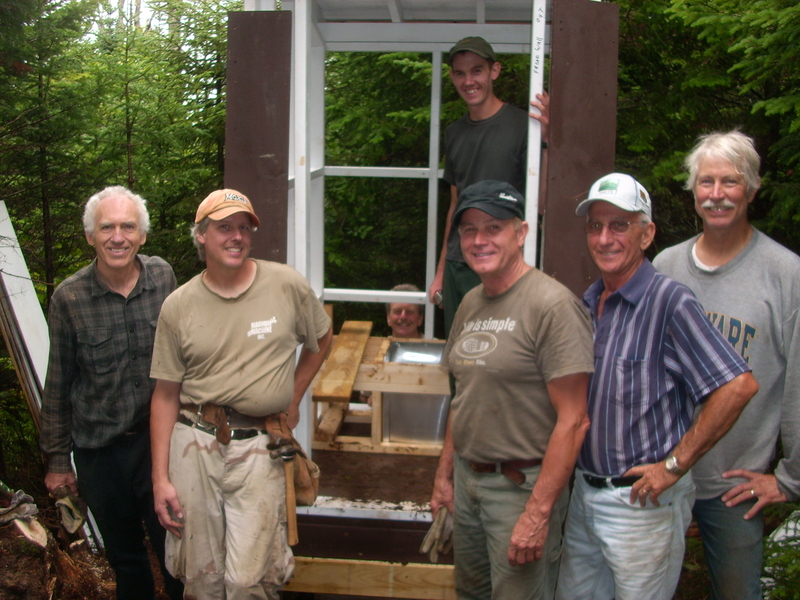 These grants come on the heels of an infusion of funds from a recent $5,000 grant from the Coos Economic Development Corporation, $17,000 from an anonymous Vermont-based donor, and the donation from the Museum of the White Mountains of a new, large log lean-to shelter to be erected along the trail in 2016. Now, with substantial resources to work with, the association plans to develop nearly five miles of all new trail in the Nash Stream Forest, greatly upgrade miles of existing hiking trail throughout the county, install long bog bridge spans in Jefferson and Pittsburg, produce wholly redesigned maps, provide world-class signage at trailheads, build a new shelter in Stark township, and set aside funds for the construction of another new shelter on the trail in 2016. The hiking trail group will provide matches in dollars and volunteer in-kind effort to help augment the grant monies. Already the group has received offers of building material donations to further stretch the reach of the funding. Now in its fifteenth year of existence, the Cohos Trail is increasingly seen as a potential economic driver for the county, bringing in increasing numbers of hikers and peak-baggers who wish to experience mountainous terrain without pressure from crowds of hikers on the high peaks of the White Mountains. As the trail matures and more shelters are erected along its long length, outdoors enthusiasts are finding more and more reason to explore the new terrain that the Cohos Trail offers. 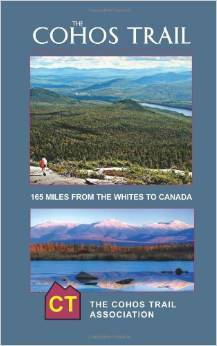 The White Mountains attract some two million hiker visits per year. TCTA has been trying to lure just a few percents of that traffic farther north into central and northern Coos County. If they succeed, as they hope, their efforts could have an incremental yet substantial impact on the overall recreational profile of the county.